At the beginning of each new year, making all kinds of resolutions is a tradition. Despite good intentions, however, our new goals often fall by the wayside after a few weeks. Why is it so hard to improve lifestyle habits? Let me ask you a simple question: How long have you had the same dietary habits? Ten years? 20 years? 30 years? That’s precisely why it’s so hard to change a habit. It’s deeply rooted because it’s been part of our way of life for so long. To adopt a new behaviour, you need to take the time required, and sometimes that’s a lot of time. It can take months for a new way of doing things to become an integral part of your daily life. Unfortunately, if you go too fast, your original inclinations can quickly make a comeback. For the next three months, I’ll cook a vegetarian recipe once a week. For the next 60 days, I’ll take a 15-minute walk twice a day. For the next month, I’ll eat breakfast every morning. Note: If you have some frozen haskaps on hand, try my Smoothie Bowl! Tip: Maximize your chances of success by posting your challenge somewhere you can see it, like on your fridge! Food resolutions are very popular, especially at the start of a new year, with many people looking to lose weight. When it comes to eating healthy, we all have a good idea what foods to eat. To help you combine them successfully on your plate, let the HEALTHY PLATE, which was developed by a group of nutrition experts from the Harvard School of Public Health, inspire you. The purpose of this food guide is to encourage people to fill half their plate with vegetables/fruits, one quarter with whole grains and the last quarter with a healthy protein (e.g., legumes, eggs, poultry, fish). Where milk and dairy products are concerned, aim for one to two servings a day. No matter what your current eating habits are, striving to eat more fruits and vegetables is one of the healthiest eating habits to adopt. 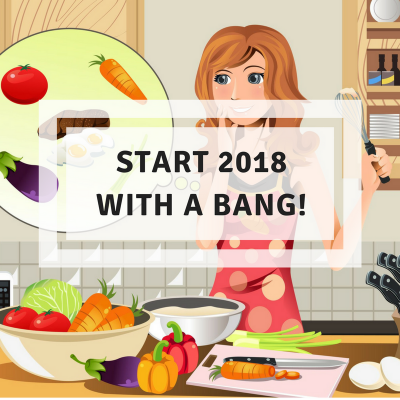 For pleasure and health, I invite you to make fruits and vegetables the stars of your plates in 2018! Enjoy the pleasures of the table and good health! Feature fruits and vegetables prominently in 2018!